Toastmaster Julian kicked off the meeting with a personal story revolving around surveillance. His personal story on surveillance came about from a recent visit he had while looking into Montessori schools for his son and how instructors and students were on constant watch from behind a two-way mirror. Some people believe in a god who is always looking down on them, and also alot of people think that this is just what modern society does online today. That everyone is watching everyone else, through mediums such as facebook and you tube. Julian stated that people often filter what they post online. That being news which is in a more positive and not negative light. As toastmasters we understand that we are being watched when speaking at meetings and we accept this as we understand that we are in a friendly and supportive environment. 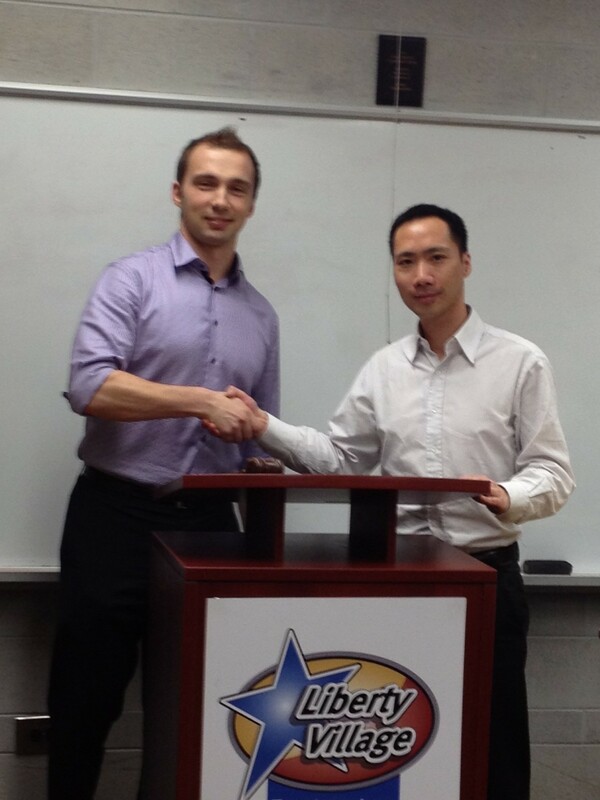 Tonight new member Vlad was also inducted into our club Liberty Village – Welcome Vlad to the team! Francisco’s comedic twist on his final inspirational speech truly grabbed listeners attention. He showed his progression through his speeches by stating the meanings behind each speech and how each speech affected the audience. Francisco stated how toastmasters slogan is that they create leaders. Realizing that every misstep through his speech projects and speech contest only made him stronger. 1- If the crowd hates your topic then you should just stop it. 2- Rehearse till it hurts. 3- If you do not know your crowd then the snoring will be loud. Title: Hair: What is it good for? Andrew’s humorous speech about how hair is a useless feature, had the audience bursting out in laughter. Andrew held the audiences attention with a flashback story to when he was a younger boy and discovering his mother in the kitchen waxing her legs. Going onto express the lengths women and men go through to rid our bodies of unwanted hair. Ultimately realizing how much we really don’t like hair exhibited through the time and money we spend on getting rid of hair on a daily basis. Andrew captured the audiences imagination leaving an impact on all listeners, having us looking forward to his next speech. The speeches where followed by a table topics session lead by Jay. Following the theme of surveillance there was a variety of questions to challenge speakers ability to think on the spot. Table topics winner was guest Hala with her speech on what she thought about being able to videotape people anywhere at anytime. Cameras and technology have revolutionized the way we think and do business. The meeting was concluded with a great evaluation session including weekly reports on grammar, filler words, John’s quizmaster questions regarding the content of presentations and meeting timing. Overall beneficial evaluations were delivered by Ted and Ian which focused on encouraging the speakers and offering advice for future improvement. Speakers, guests and evaluators truly showed they were going for it tonight! This entry was posted in Uncategorized and tagged liberty village, liberty village toastmasters, maria lalla, public speaking, toastmasters, toronto public speaking, toronto toastmasters. Bookmark the permalink.